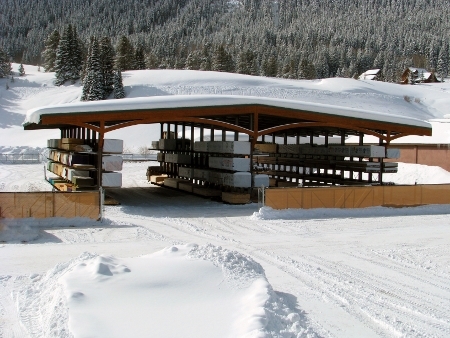 Alpine Lumber Crested Butte sits at an elevation of 8900 feet above sea level, making it the highest facility in our company, with an average snowfall of over 200 inches a year. Our 9200 square foot covered storage keeps all of our lumber products and sheet goods dry and shaded throughout the year. Four of the five delivery trucks in our fleet are four-wheel-drive so we can meet our customers’ needs no matter what the conditions are. Inside we have a very knowledgeable staff offering years of experience in the industry. We provide material take-offs including lumber, roofing, siding, decking, doors and windows to help our customers accurately budget their project. Tool Heaven. Our retail space at Alpine Lumber Crested Butte boasts a variety of builders’ hardware, a full line of Dewalt power tools, Hitachi pneumatic tools and a huge selection of Festool products and demo tools. We have the right mix to keep our customers moving forward.